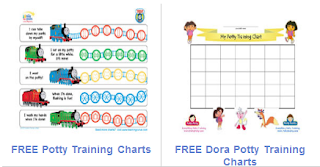 The Free Potty Training Charts come in a variety of styles and characters to choose from. They come in Disney Cars, Diego, Disney Princesses, Dora, as well as First Years and traditional Potty Charts and calendars too. Also, browse through all the Free Potty Training Videos, Free Potty Training Tips and Free Potty Training Advice as well. There are plenty of choices and there are different ones that are even specifically for boys and girls too.